The SCREENPLAY Development Centre is being built in an attempt to generate a steady stream of commercially-viable feature-length screenplays. 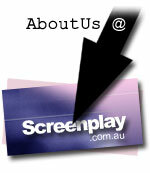 We aim to increase the vitality and commercial success of the Australian film industry by empowering the writer. The stronger the screenplay, the better the potential of the film. We envision a growing, dynamic community, where screenwriting matters! Because no one works until the writer writes. If you have skills or resources you believe would be valuable to the growth and success of Screenplay.com.au (and you'd like to get involved), we welcome you contact us today.